To know how to find properties to flip, an investor will need to follow 5 important steps. These steps are choosing the right neighborhood, checking housing market statistics, verifying the condition of the fix and flip properties, forecasting the overall budget, and calculating the potential profit. Fix and flip properties often require fast funding. LendingHome can fund fix and flip properties in as little as two weeks. Their interest rates start at 7.5%. The online prequalification process is quick and easy. Choosing the right neighborhood is an important place to start your fix and flip journey. The three primary things you will want to look at when evaluating a neighborhood for a fix and flip are curb appeal, amenities, and school district. You can change the curb appeal of your property, but not of the rest of the neighborhood! Choose a neighborhood that is well kept where residents show pride in keeping up their homes, regardless of the price point. When identifying a neighborhood, look for vacant homes and boarded up buildings on your block; these detract home buyers and are easy targets for crime. They bring down property values and make it more difficult to get a mortgage or property insurance. While they may not affect your purchase decision, they will greatly affect your potential buyer’s decision to purchase your property. Besides neighborhood upkeep, the local amenities are important too. Are there things to do in and around the neighborhood that will make home owners choose to live in this particular area? Buyers want to feel a part of the community and being in close proximity to certain amenities makes that possible. The home should be close to a business district but it needs to actually be in a residential area. This will provide the camaraderie of neighbors, convenience of businesses nearby and the quiet of a residential area. When identifying a neighborhood, the public school district is a major consideration. Anyone purchasing a home with school aged children will be researching the local schools. A helpful site is GreatSchools. 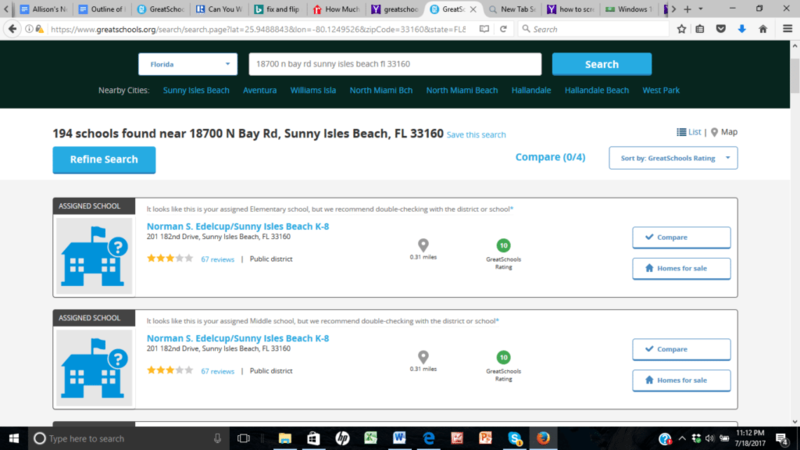 You can type in the property address and it will provide your district’s assigned elementary, middle and high school, as well as their ratings and reviews. It also shows each school’s distance from the property. In urban areas, being able to hop on a train or bus or even walk a few blocks to school is a plus, whereas in suburban areas a school several miles away is fine since most of them offer bus routes. Below is an example of what the site looks like. Look for high ratings for each school (10 is the maximum), read the other parent’s comments and check out the student teacher ratio, class size, and the percentage of graduating class attending a higher learning institution. These factors are important to potential home buyers, so should be important to you, since being near a good school district can increase the value of your home. Don’t just take our word for it, one out of five home buyers said they would pay 6 to 10 percent above their budget for the right school. One out of 10 would double that to 20 percent. Those numbers mean that you may be able to get more money for your fix and flip by being in a desirable school district. Also important when evaluating a neighborhood for your next flip is that neighborhood’s proximity to both you and your team. Afterall, when choosing a home to flip multiple site visits are needed and choosing a property that’s convenient to where you live or work will save you time and money. A property that conveniently located and near major highways will ensure that any contractors you employ can easily reach you. This will increase the number of contractors that may bid on your project, helping ensure your project is completed on time and on budget. Not only that but later on, it will ensure a maximum number of potential buyers can visit the property. Now that we have looked at the importance of location and neighborhood it is time to study the housing market statistics. These statistics play an important role in finding a property to fix and flip. They will be used to calculate your budget and how much you should pay for a house in a certain neighborhood. Comparables (known in the industry as comps) are properties with similar characteristics to the subject property. Comps tell you what to pay for properties and what your fix and flip should sell for. Comps let you know if it is realistic to do a good fix and flip in the neighborhood. Look for what people are paying for homes in pre rehab condition, as well as after rehab condition so you also have a better idea what kind of offer to make on a property. The info gathered from using correct comps is critical for your budget, ARV, and ROI which we’ll discuss in more detail down below. When comparing properties, make sure they are located in the same municipality and school district so the taxes and neighborhood amenities will be similar. Keep in mind, a property on an acre lot can’t be compared to a property on a ¼ acre lot. Lot size, square feet, number of bedrooms and bathrooms also play a role in the comps. You want to use comparables which will be similar to your finished fix and flip project. Only use comparables that have SOLD. Looking at the listing price is misleading since this is not necessarily the price the home will sell for. As well as considering comps, we need to consider how long the property has been sitting on the market. Days on market refers to how long houses are sitting on the market actively listed for sale. The less days your property sits on the market, the lower your carrying costs and the higher your Return on Investment (ROI). The National Association of Realtors has prepared the following chart which illustrates the fact that when a home sits on the market it costs you money. The more days the home is on the market, the less it sells for, which affects your bottom line, effectively eating into your profit. Property taxes are an often overlooked expense for real estate investors. They are important for you because they add to your carrying costs and they’re even more important to potential buyers because they are in addition to their mortgage payment and property insurance costs. Property taxes fund public schools and vary between neighborhoods, cities, and states. Higher property taxes can deter some buyers due to the lack of affordability so it is necessary to include them in your comps, as we mentioned above, and included in your ARV, which we will cover below. Amenities and property taxes are closely tied so balancing between the potential profit gains of amenities and the potential losses of high property taxes need to be considered. There are three primary tools to find the housing market stats that are relative to your fix and flip. They are real estate websites, census data, and real estate professionals. They should be used in that order to be the most effective and save you the most time with your fix and flip property. 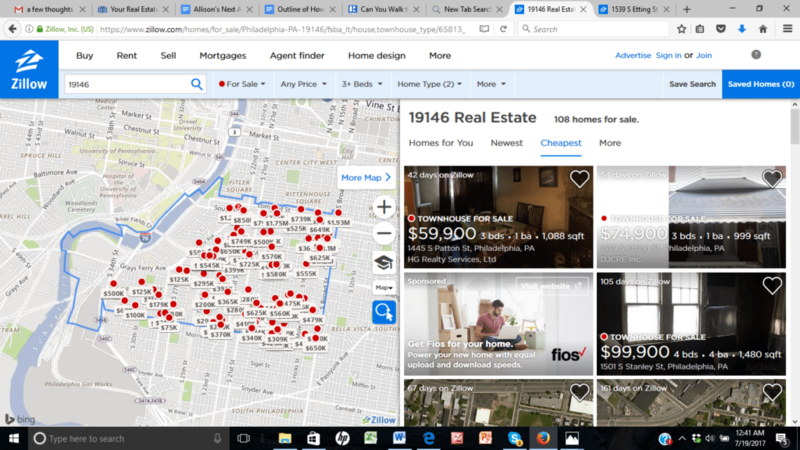 Real estate websites are helpful places to search for local and national real estate data. They are easy to use and provide you with data that will assist with deciding if a fix and flip property is a good investment. Sites such as Realtor.com , Zillow, and NAR provide comparable properties to the subject property based on similar characteristics such as the number of bedrooms. These sites also give information on property taxes and neighborhood amenities. They can be found with commonly used keywords. Another real estate website is foreclosure.com. They not only offer foreclosures but also pre foreclosures, short sales, and fixer uppers. They provide comprehensive property listing information, pictures and property history with each listing. When you delve into a deeper search, days on market will also appear. 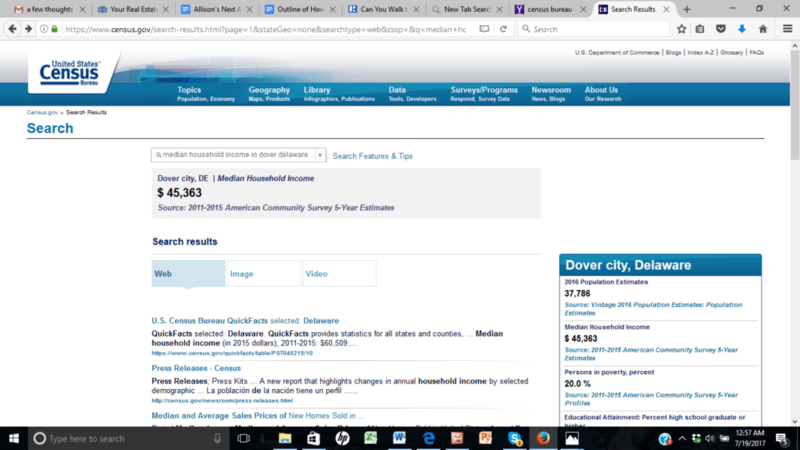 Another practical resource is the Census Bureau where you can look for median household income and household size. You may be thinking, why are these factors vital to me? They will influence the type of property you end up purchasing. If the average household size in your ideal fix and flip neighborhood is 4, it would not be a smart investment to purchase a one bedroom property since this household size will not want to purchase a small property. A good rule of thumb is that a home should not cost more than 2.5 times your yearly salary. So if the potential buyer makes $45,000 per year then the most expensive home they should consider buying will cost $112,500. Buyers traditionally put a 20% down payment on a home but today that trend has gone down and 1st time homebuyers can qualify for a mortgage with as little as 3.5% down. Knowing this info can help you see who can afford to purchase your fix and flip and in turn will help determine how much you should initially buy the property for, keeping in mind your rehab budget and ARV, which will both be discussed later on. Real estate professionals are important because they are up to date on neighborhood trends where your property is located. They can provide you with more current information than the real estate websites. They will have industry knowledge of how long properties are sitting on the market which will help you decide where to buy a property. Realtors will also utilize correct comparables to use when identifying your property and deciding how much to pay for the property. They will provide this data free of charge, in hopes of earning your business in buying or selling your property. 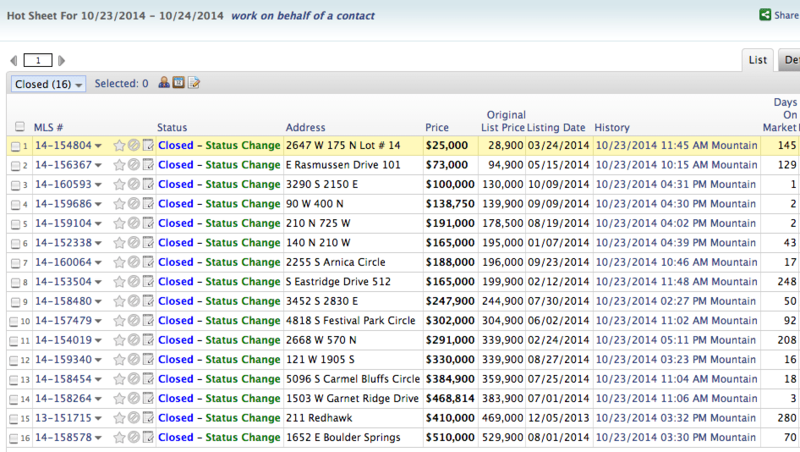 Here is an example of a list of comps that a realtor will give you. Now that you have narrowed down the location and neighborhood, it is time to focus on the ideal property condition for a fix and flip project. Choosing a property in the right condition can help attract buyers and sell your property faster. These will positively affect your return on investment. Avoid choosing a property with any structural issues. These can be seen in the form of extremely uneven floors, large cracks in the cement and a sagging foundation. These issues can increase the time of the rehab and this will eat into your budget, increase your timeline and put added stress on the process while cutting into your profit. Key features to look for in a potential fix and flip project include anything that may be difficult to add/change. Focus on homes that already have positive features popular with buyers. For example, it can be costly to make the needed space for an additional bathroom and run the plumbing. These will bring the most added value to your fix and flip, which means that it will sell faster, lower your carrying costs and increase your potential profit. Room sizes: large master bedrooms are popular and other bedrooms should be able to comfortably fit a Queen size bed with room to walk around it. Number of bathrooms: full bathrooms add more value, but if the house has more than 1 floor, a half bath downstairs is valuable so guests can use it without going upstairs. Overall layout should be open and the kitchen and living room should be adjoined for easy entertaining. It can get expensive if you buy a home that needs several walls torn down. A 2 car garage in suburban locations is a popular request. Unless the house is a luxury property, more than a 2 car garage won’t add much value. Features to avoid in a fix and flip include projects that will be too time consuming and need additional permits. Now you know what to look for in a home, it is just as important to know what to avoid. Structural issues such as foundation cracks and uneven floors which take too much time, expertise and money to fix. Outdated layouts that don’t make sense to today’s buyers such as closed off spaces and low ceilings. Narrow kitchens with load bearing walls. Too many bedrooms and not enough bathrooms, for example, 5 bedrooms and only 1 bathroom. A bedroom where you have to walk through another room to get there. Basically, anything that is not easy to fix and will be a hard sell. Look for properties that only require cosmetic repairs. They will be the least time consuming and the least expensive types of repairs. This is especially helpful for first time property flippers. These are minor repairs that will lead to major financial rewards. Painting the entire interior of the house a neutral color and covering all holes and blemishes on the walls and painting the trim a different neutral color. Putting down new carpet that is a neutral color, but not too light that it attracts dirt. Installing new light fixtures that illuminate the space. Updating plumbing fixtures with modern finishes. Adding new appliances that all match and fit in your budget, if the home is in a higher price point stainless steel appliances will be expected. Outdoor improvements including mowing the grass, adding planters and painting the front door and power washing the outside of the home to brighten it up and this can avoid a costly exterior paint job too. The DIY Network has some helpful tips for what cosmetic repairs to add to your fix and flip in order to get the most bang for your buck. The budget for your fix and flip project is important because it will determine how much return on investment you make. Your budget should be well thought out and adhered to. Always add some cushion into the budget in case there are unexpected expenses. Acquisition Cost: the cost of purchasing the property. Rehab Costs: labor and materials cost to renovate the property. Carrying Costs: insurance, utilities, financing costs, etc. Marketing and Sales Costs: the costs needed to list and sell your property. Important to remember is that going over budget does often can’t be rectified with a higher selling price. With that in mind, it’s absolutely essential to stick to your budget if your flip is to be profitable. For a deeper look at the budgeting process, read our article on the cost of flipping a house. The home’s After Repair Value which we address in the previous section. Cash and financing and their associated costs. What’s selling in the neighborhood and with what features so you can determine what needs to be added to your home. Your timeline because certain repairs take more time than others and this can throw off your timeline which in turn can negatively affect your budget. Remember to add unanticipated costs into your budget. These can be contractor delays, weather delays, items on backorder and anything else that can hinder your fix and flip’s progress. A good pro tip is to add 20% to your budget for unexpected repairs and add one week for every month of your timeline. For example, if your timeline is 2 months, add 2 weeks just to be on the safe side. We have identified a neighborhood and market that work for a fix and flip and we have narrowed down what repairs add value to the home and the importance of avoiding structural repairs. It is now time to calculate ARV (After Repair Value) so you can complete your budget. The ARV is how much you will be able to sell the house for after it is rehabbed. In order to make sense financially, it needs to fit with how much you purchased the property for as well as your repairs and carrying costs. It is important because it determines how much profit you will make off your fix and flip and the higher the profit the more your time and money were worth it. If you don’t meet your expected ARV you may end up losing money on the project, so it is critical to follow all of the steps in identifying a good fix and flip property in order to avoid this. When calculating ARV you need to use comps that are relative to your subject property in terms of bedrooms, lot size, square footage etc, which we covered earlier in the Comparables section. These comps need to have sold within the past 90 days in a strong market, or within the past 6 months in a soft market. A soft market is just a real estate market where there are more homes for sale than there are buyers so with this high inventory, it tends to sit on the market longer. Start with the end number and calculate backward when determining what your ARV needs to be. This just means that you start with the number that your home needs to sell for and then factor in your budget for all of your acquisition expenses, carrying costs, and repair expenses. Most seasoned investors that fix and flip regularly use the 70% to 80% rule. It varies depending on if it is an urban, suburban or rural area and how well the market is doing in that area. This formula says that you want to leave wiggle room for things to go wrong as well as for buyers to be able to negotiate the price down. If you use the 70% rule and the property’s ARV is $100,000 and your rehab budget is $20,000 then you need to pay $50,000 for the property. A different example shows how the numbers break down and determine your profit. ARV can be used in a number of different formulas, as can budget, but the most important thing to consider is be conservative in your calculations, count on unexpected expenses and make sure you stick to your acquisition and renovation budget so you can get the highest ROI. This can all be done when you follow the steps to identifying a good fix and flip opportunity. 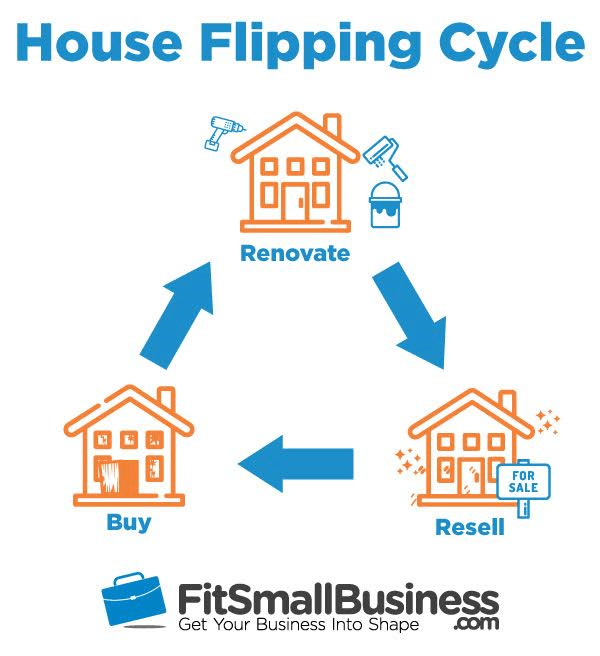 Now, that you’ve found properties that make sense to fix and flip, you can see how the house flipping cycle looks on the image below. I hope you have found this comprehensive guide helpful and now know how to find properties to flip. Choose the property based on its location, neighborhood, property condition, your budget and the property’s After Repair Value. Be sure to check out our additional resources for more information on real estate investing and the fix and flip process. If you need financing for your fix and flip property, contact LendingHome. Their interest rates start at 7.5% and they’ll lend up to 90% LTV and 75% ARV. Prequalifying online only takes a few minutes. Such an awesome article, I would only like to add that one should effectively look for a home built after 1978. This will make the chances of it having a lead based paint lesser, otherwise the Renovation, Repair and painting laws governed by EPA would make renovation lengthier and complicated. So to save time and money, one should stick to properties built after 1978. Hi Iris. I’m so glad you enjoyed the article. Thanks for the tip about lead based paint. ‘Driving for Dollars’ is an excellent way to find potential properties. It allows you to check out the neighborhood like Allison described. In Florida there are many houses that are ‘vacant’ but not abandoned which you are looking for. This is because many of these houses are typically owned by out of state owners. You can easily find this out by looking at the county assessor’s website to see where the owner lives. Other ways to find potentially great investment properties is to research ‘tax deed auctions’, Code Enforcement Liens, foreclosures, probate, ‘prior to probate’, just to name a few methods. I found your article to be extremely helpful and it helped me make the decision to buy a property near shopping instead of one near a fire station like my realtor was pushing for. Thanks! Thank you so much Oscar. I’m glad you enjoyed the article. Best of luck with your new property!